Elegance and Mommyhood. 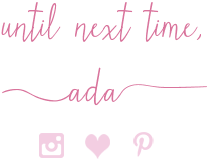 : Thursday Moda #143: The Holiday Series 2018, Holiday Winter Wedding. You look beautiful in red Ada and this outfit is simple yet so stylish. Love your clutch and shoes - so fun, festive and perfect for a wedding. Bring on all the sparkle! I hope your week is going well so far and happy Thursday! Ada, I love the idea of separates for a dressed up look! And this leather skirt with red blouse is so pretty and festive! I am loving your sparkly shoes and clutch, too. Perfect for any holiday event really! Well done. And thanks so much for pulling all of this together once again. You rock! Love this holiday look Ada! That skirt is amazing. Thanks for the link up! That is a beautiful look, Ada. I really like the skirt and sparkly sandals. The fact that the outfit is the colors of your flag is special, too. What a fun festive look! You'd be a standout at a wedding for sure! You look stunning Ada. Also I'm in love with your shoe. Gorgeous, I love all the sparkles and that the skirt is a little bit edgy. 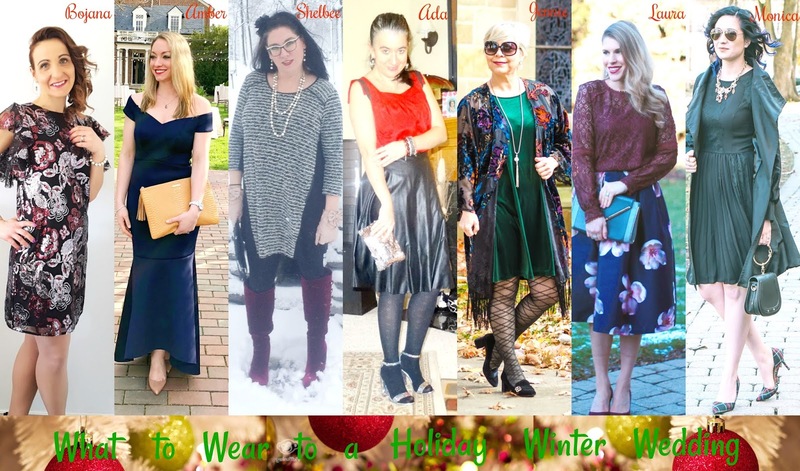 I love these beautiful holiday styles! Your sparkles are gorgeous Ada! What a pretty festive look on you! 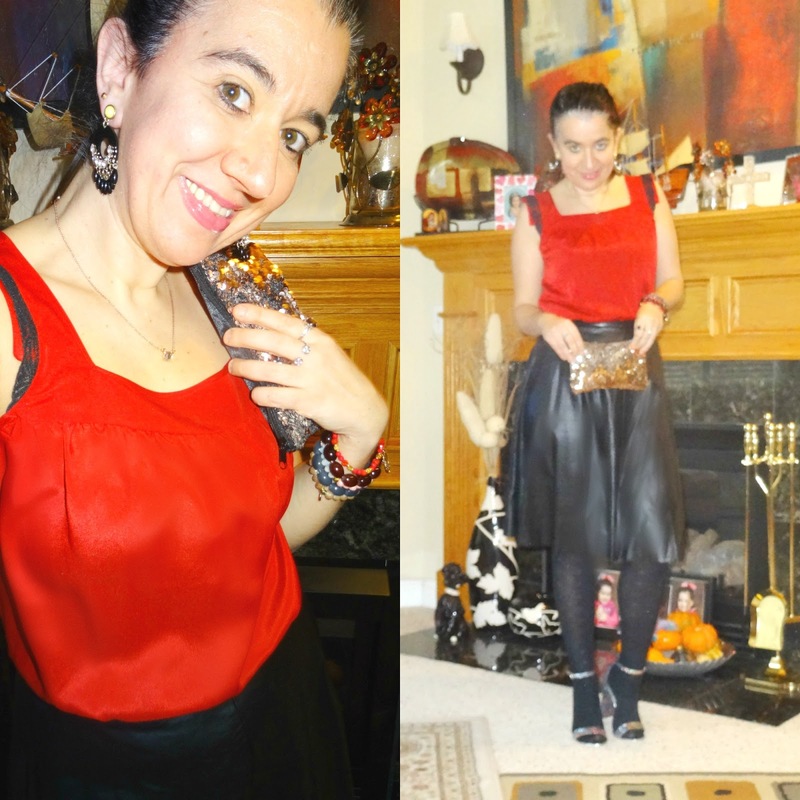 I love the red- with your leather skirt and I am such a fan of tights with sandals. Love the silvery clutch too! Ada, this is such a fab look, but I think my favorite part is those sparkly sandals! So much fun! Shelbee nice festive outfit . I love pop of glitter and sparkle in your shoes and bag . Amazing 😉. I love that you chose a skirt to wear too! Your leather skirt is so much fun! 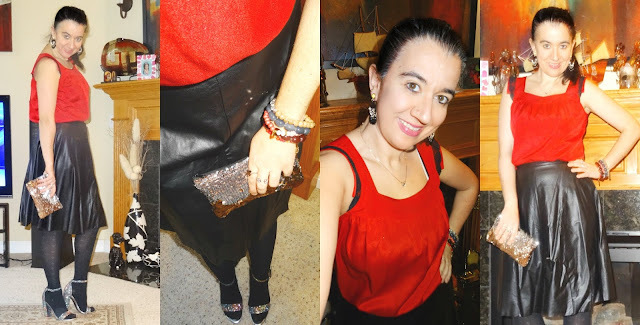 I always love an outfit with black and red together, and this one looks fabulous Ada! Your faux leather skirt is such a great piece! You look so pretty and festive in your red and sparkles! I like this addition of patterned tights with the faux leather skirt. Tres chic! How fun! I love how you all came together to give readers some holiday outfit ideas. 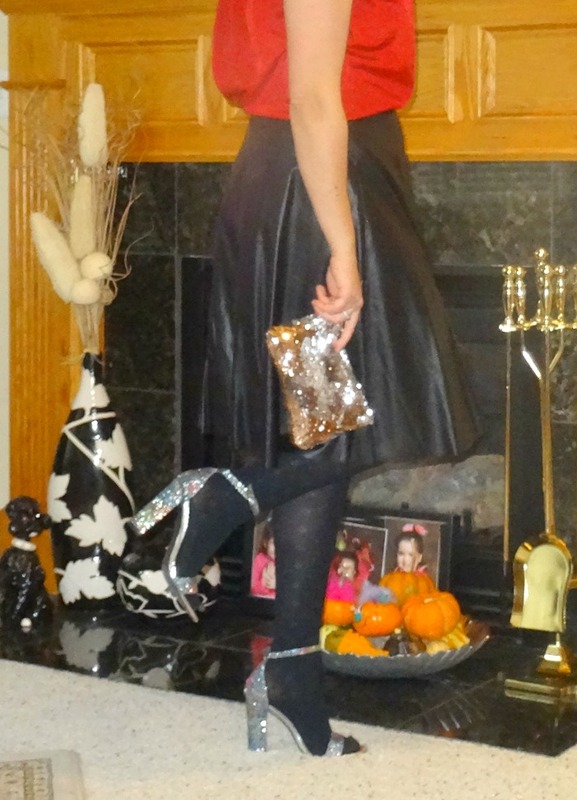 Ada, your sparkly shoes and clutch are so pretty! Love your red top with that skirt as well. Can't go wrong with black and red, right? Especially at Christmas time! !